Food and nutrition projects were a mainstay of early 4-H. After all, Health was one of the four H’s represented in the organization’s name and emblem that were adopted back in 1911. Articles about food and nutrition projects and programs were plentiful in many editions of the National 4-H News magazine. The magazine carried stories about 4-H members involved in canning, dairy, food preservation, gardening and meal preparation. The April 1939 issue carries a feature on Ruby Hudson, a 16-year old Missouri 4-H member who had recently been selected the winner of the annual cherry pie baking contest held in Chicago. The annual contest was held to celebrate George Washington’s birthday in February (his 207th in 1939), and was sponsored by the National Cherry Week Committee and the “Hatchet Club.” Ruby took her first train ride for her visit to Chicago for the contest accompanied by her county home demonstration agent. As the contest winner, Ruby received a check for $100 and a sight-seeing trip to Washington,DC for herself and her chaperone. 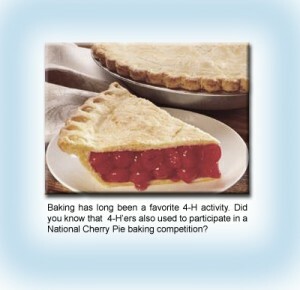 This entry was posted in History and tagged 4-HHistory, CherryPie, RubyHudson by Sue Benedetti. Bookmark the permalink.